A close-to-home cruiser of a hike winds through a moist forest and leads to relics of the past. A mist settles amid trees hanging with nuclear-green moss, a creek gurgles with fresh snowmelt and hiking boots tromp through patches of mud. The time is right for a quintessential Northwest lowland hike. 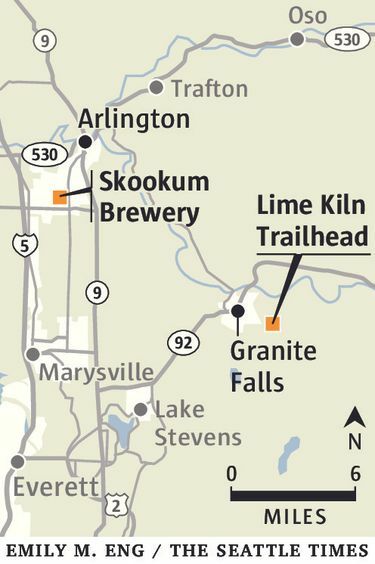 The Lime Kiln Trail, just east of Granite Falls, delivers that in a cruiser of a hike that features a history lesson along with riverside beauty. 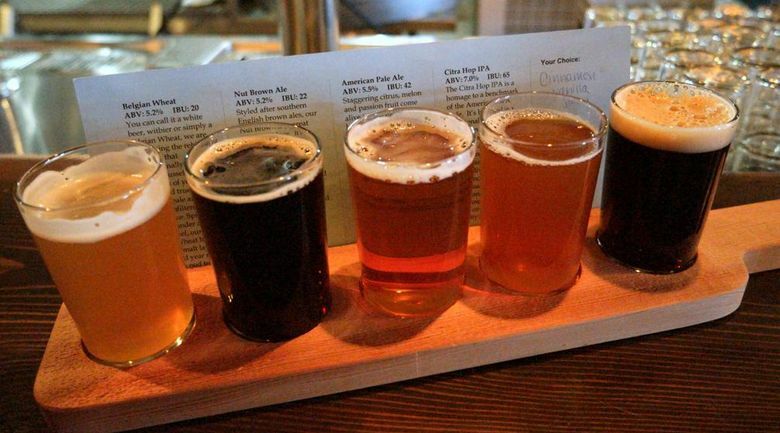 Afterward, top off your Northwest experience with an IPA dripping with juicy hops at nearby Skookum Brewing. The facilities: Parking for about 20-30 vehicles is available at the trailhead. A kiosk with a map and history of the trail’s route is situated at the start of the hike. The hike: The Lime Kiln trail cuts a gentle route through Robe Canyon Park as it passes birch trees, blackberry brambles and occasional evergreens. About 1.4 miles in, a signed turnoff sends hikers descending to what was once the path of the Everett-Monte Cristo railroad, which led to mining camps where a brief gold rush brought prospectors in 1889. From there, the trail sidles up to the South Fork Stillaguamish River and meanders along a mostly flat grade above the river. Moss carpets trees, rocks and pretty much every surface it can find. Trickles of snowmelt drip down the hillside and pitter patter along the trail. The steady churn of the South Fork Stillaguamish’s waters accompanies birds singing softly in the treetops. 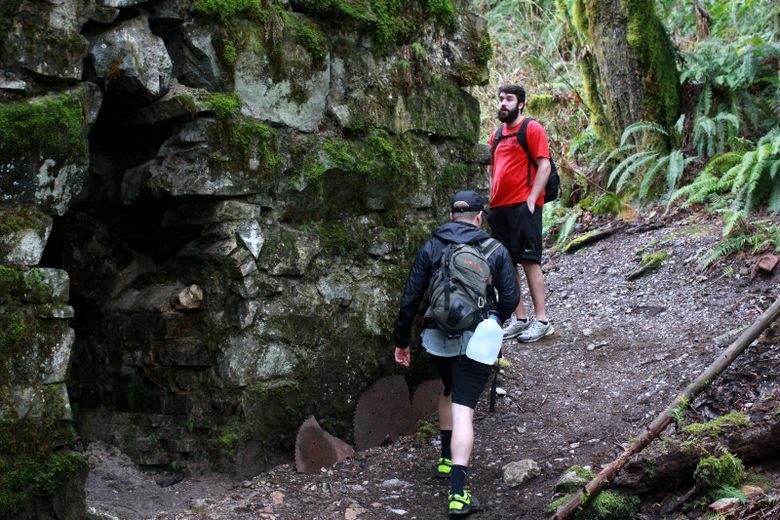 About 2.5 miles in, hikers approach the lime kiln, a stone and mortar structure that rises about 20 feet high. The forest is slowly reclaiming the kiln, which is half-swallowed by moss and other flora. 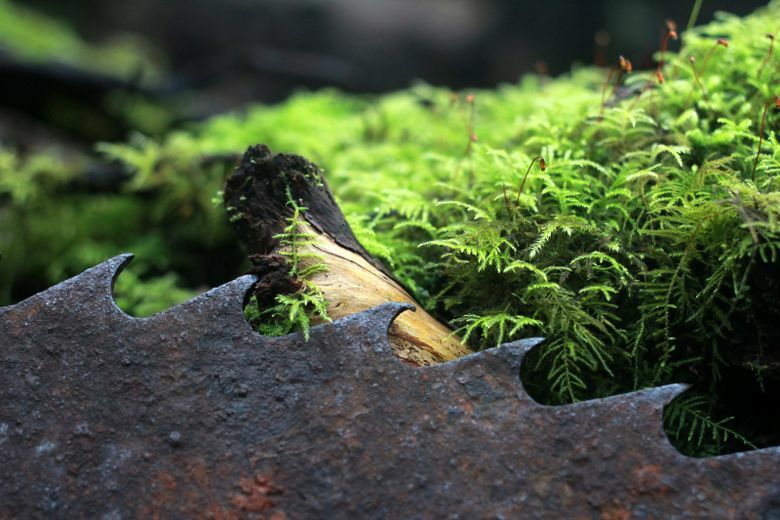 On the forest floor, rusted saw blades blend in among sword ferns. Castoff bricks and other tools sit at the base of the kiln. There’s history here. The kiln was once used to heat limestone to be shipped west for industrial use. The saw blades are remnants from a logging and sawmill operation. The railroad line, which stretched to Monte Cristo, was abandoned during the Great Depression and removed a few years before World War II. The trail continues on for less than a mile before reaching a quarter-mile loop that brings hikers down to the riverside. In late February, silty snowmelt made for a pale waterway the color of a lime sorbet. The base of an old railroad bridge can be seen from one side of the loop. On the other, a path descends to a small beach in view of some rapids, which makes a nice spot for a snack if the water level is compliant. Then, it’s time to amble back to the car. On a weekday, the trail offered easy access to relative solitude. I counted just 11 people (and two dogs) on the trail. Hikers should expect to spend between three and five hours on the 6.5-mile trail, though it’s mellow enough to breeze through in less. Most people won’t need to bother with trekking poles; the trail is well-maintained and easy on the knees. Fitter folks might consider making this a trail run. Restrictions: No permits are required to park at the trailhead, but signs warn people away from the road. Mountain bikes and horses are allowed for the first 1.4 miles, until the turnoff. Dogs are allowed if leashed. Directions: In typical traffic, it will take about an hour to reach the trailhead from downtown Seattle. From downtown Granite Falls, take Pioneer Street, which becomes Menzel Lake Road. Turn left at Waite Mill Road and keep left until you see a turnoff for Robe Canyon Historic Park. There are several signs along the route that lead you to the trailhead. 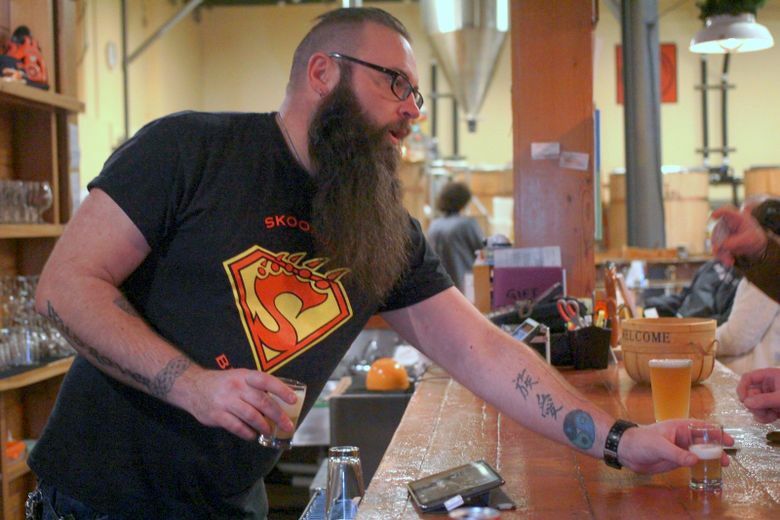 “We’re kind of an IPA powerhouse,” said Phil Green, one of two brewers at Skookum. Indeed, six of the brewery’s 14 beer offerings were juicy, hop-forward IPAs, which were unique and tasty. Skookum also experiments with bold flavors that will pique some people’s curiosity but won’t fit everyone’s palate. Recent offerings included a sweet raspberry milk stout and an ale brewed with toasted almonds, vanilla and Camano Island coffee. The smell of malting grain hits you in the nose as soon as you walk in. Converted from an old Bayliner Boats factory, Skookum is plain on the outside, but cavernous and still cozy inside. The brewery and tap room are adjoined, and offer a full view of the brewers who are eager to share their craft. Open noon-8 p.m. Wednesday-Thursday; noon-9 p.m. Friday-Saturday; noon to 6 p.m. Sunday. A rotating cast of food trucks is available almost all of the hours Skookum is open. Entertain yourself with darts, board games and cards. The brewery hosts cribbage tournaments, dog days, murder mystery dinners and paint-and-pour classes. “There’s always something going on,” said Jessica Bailey, who organizes these events. In summer, patio seating allows aviation afficionados to watch as planes land at Arlington Municipal Airport, which is across the street from the brewery. No kids allowed. “Well-behaved dogs are approved,” Bailey said.